Personas are a practical tool to help prioritize content and functionality. They are fictional characters based on an identified audience or user type. They serve as an encapsulation of your understanding of the intended audience. Personas typically include a hypothetical person’s name, key demographic characteristics, motivations, anxieties, and the tasks they need to complete with regard to a website, application, or service. Personas are created with information gathered from user and stakeholder interviews.As a result of these activities, you can identify the most important functionality an audience needs. These personas will aid in making design decisions and build empathy while maintaining objectivity. They can also serve as the basis for user testing(link) that is conducted to validate the website. Personas are not intended to capture all needs or functionality of the site. Rather, they serve as an understanding of a site’s most important priorities. Journey maps are created from research gathered through user interviews, user testing, web analytics, support logs, surveys, and competitive analyses. A journey map displays this research through storytelling and visualization. It presents a humanized situation from an elevated perspective to show a user’s true experience. 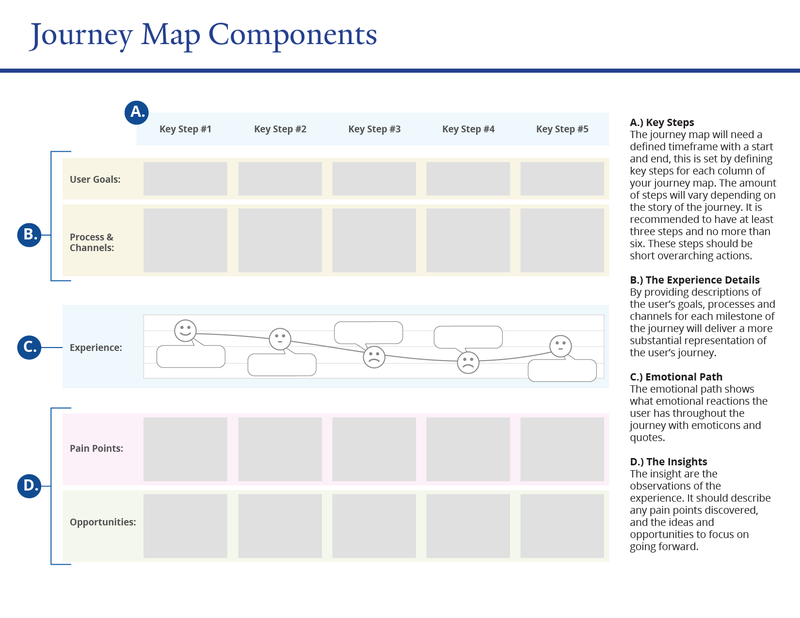 Journey maps are formatted as a matrix, which each column representing an important step in a larger process. The matrix also represents processes that a user’s goals, pain points, and emotions, as well as processes that the user interacts with and ideas for improving that process. Provides a clear picture of the user experience. Creates empathy for the user. Identifies opportunities to enhance the experience. Identifies gaps between devices, departments and channels. Can help understand quantitative data.